Some men fight for money. A few fight for women. Fewer still fight for honor. And one fights for justice. A man with a masked face. To protect his identity. No, we don't mean Batman. We mean a masked vigilante older than the Caped Crusader. No we don't mean Robin Hood either. Are you a man who fights for justice? 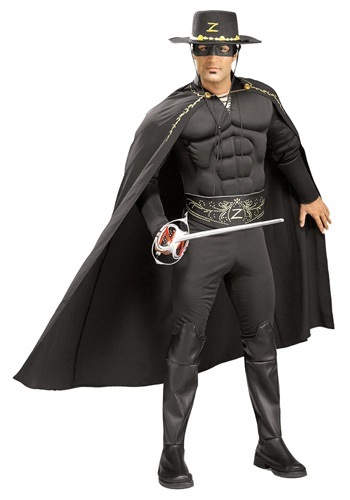 If so, this Adult Zorro Costume is the perfect thing for you. You will have everything you need to start dispensing some vigilante justice. Well, everything except the sword. If you don't have access to a master blacksmith worry not, we also have a Deluxe Zorro Sword. You don't need to be a brooding bat, or a dirty woodsman to stop bad people from denying people their freedom. This costume lets you be the suave Mexican Don, as you save the people of Los Angeles. You will have a lot of opportunity to use your sword, be it against foes, or slashing the classic Zorro "Z" as a warning for any oppressors. when you are doing the fitting size option do exact size because it fitted great when i put it on.